On Friday, April 3, the Chandra X-ray Observatory released a new image (with 10 times more data) of supernova B1509 which is now available on the Smithsonian Flickr Commons photostream. Chandra orbits the earth every 2.5 days capturing images of x-ray light (not seen by the human eye) which is emitted by matter at extremely high temperatures. The supernovas, star clusters, and other ‘dark energy’ they capture tend to have really intriguing names such as Hydra A, G292.0+1.8, Eta Carinae, etc. In capturing these images, scientists are able to learn more about the origin, evolution, and destiny of the Universe. To celebrate the International Year of Astronomy, we will have guest bloggers throughout May 2009 talking about Smithsonian images of space. 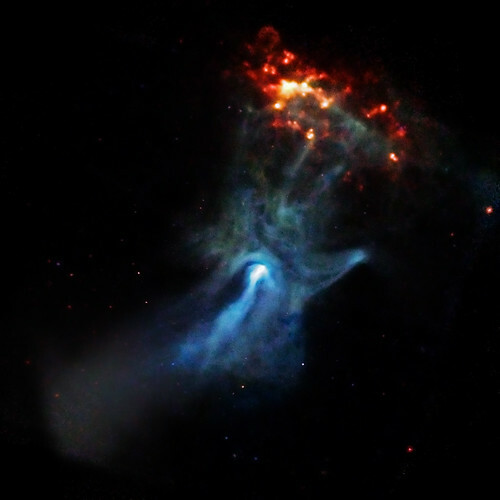 In the meantime, you can learn more about Chandra X-ray observatory and the supernova here.